This afternoon we're taking part in the Food and Drug Administration's public hearing to discuss the online advertising of regulated medical products on the Internet. The two day hearing - being live cast and Tweeted - is intended to help guide the FDA's policy decisions, especially in the areas of social media tools and search. We think it's an important conversation and we share their goal of better understanding how to promote medical products online in a non-misleading and balanced manner. That's why at today's FDA hearing, we proposed a new Google ad design for FDA-related approved products that highlights an extra line of text clearly stating important risks, with a link to even more information for consumers. We think this new format will help set a clear standard for advertisers and give users important information. The Internet, and how people use it, has changed a lot since the FDA last examined access to online health information in 1996. On Google alone, we've seen health condition searches increase several times over. What this tells us is that people find health related searches - and the ads they return - useful. We think this new ad proposal for FDA-approved products will make those searches even more helpful. The live cast link doesn't work for people not in the google.com Google Apps system. will Google apply a similar approach for ads outside the USA? Thanks for sharing this data. 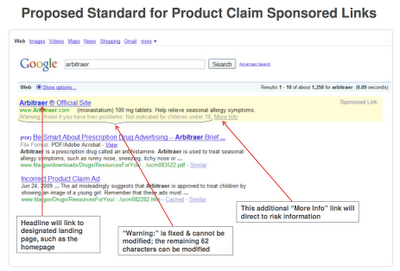 This demonstrates the unintended consequence of FDA sending Notice of Violations to every pharma for Google Adwords. Transparency and trust suffered, and the patients engaged less with approved products and brands.